Richard "Lord British" Garriott is fed up with videogame publishers, and wants the players to take their place for his upcoming online RPG, Shroud of the Avatar. 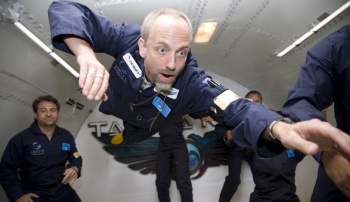 Ultima creator Richard "Lord British" Garriott once paid $30 million from his personal finances to become the sixth ever "space tourist." $1 million seems like it would be a drop in the bucket for the game design legend, so why is he asking Kickstarter backers to foot the bill? Garriott explains to PC Games N that it's more about the developer-backer relationship than the money. First, Garriott assures us that he has poured millions of dollars from his personal fortune into getting his company, Portalarium, off the ground. He says that Portalarium is "only trying to raise about one million dollars through this crowdfunding campaign," and the reason is not because it necessarily needs the money, but because Garriott doesn't want to be held accountable to a publisher. "As I reflect on my own career, each of the times that we have forged a deep relationship with another publisher, those very next games are the games that have shipped the least well, shall we say?" Instead, Garriott wants the players themselves to take the place of publishers in the development process. Garriott says that signing with a publisher means you become slaves to them, rather than the audience. He'd instead rather that his players themselves become his "task-masters" for his next project. "You become slaves to your publisher as opposed to slaves to the audience and we're trying to make sure that the task master we are listening to - starting them early and getting them into these alphas and betas - is the player, and not the publisher." While Garriott says that the $1 million will be put to good use for the game's development, the Kickstarter is more of a "self-selection process." "By embracing [the core audience] and bringing them into the development process, it lets us suss out a lot of problems," he said. Shroud of the Avatar has raised $730,000 USD at time of writing. It is set to be an "MMO-lite," with a persistent world and a focus on questing in small groups. It is the spiritual successor to the Ultima series.